The GM LS V8 has evolved to become a significant contender to replace the Chevy Small Block V8 (SBC) and many of its aftermarket variations. The development of variations producing significant power levels for the Corvette, Cadillac and some trucks has resulted in basic components produced in volume that can be used to build engines of even greater power at reasonable cost. The aftermarket has recognized this with a growing array of performance parts to fit these building blocks further reducing the number unique parts that need to be produced to complete a racing engine. 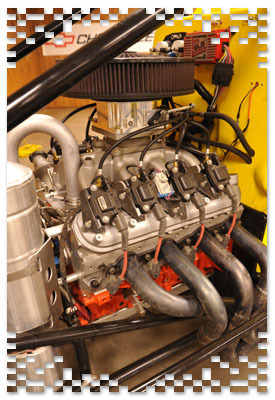 This presents the opportunity to create a low cost, light weight, high power all-alloy engine similar to engines derived from the original Chevy Small Block.  all aimed at keeping cost down and longevity up. Below is a list of parts that were used in the first A4MP engine. These are suggested parts, but we realize some parts could change to make it easier on the engine builder.